On June 20, D and I went to look at my dream house. It was in rough shape. 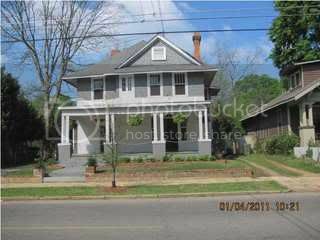 A 1910 Craftsman with four fireplaces and no central heat and air. That's a big deal here in the south. As soon as I walked in, I loved the house. We hadn't planned on moving until January. But, sometimes things workout in unexpected ways. Today, we got the keys. We are going to be restoring a 100 year old house. My big secret is we're moving. In three weeks. In to my dream house. My blog will soon be full of home improvement things. And I think back to my Be Her goals for June: Be positive. We were positive. We were hopeful. And for July the goal was humble. And I've truly been humbled by how we've been blessed. The seller of the house agreed to our terms. They are wonderful people who live in the neighborhood. And it's a real neighborhood where people walk on the sidewalks and play in parks and have community meetings. Truly humbled by the blessings. Congratulations!!! Our house was built in 1872 and we love it...although we would love it more if we had a lot of $$ for huge renovations, LOL! The money pit comments can get tiring but overall we love our old house and all of its quirks and imperfections. So excited for your family!